Small dog syndrome is a cause of excessive barking. Barking is part of your Chihuahua's way of communicating; you shouldn't try to stop it entirely. Excessive barking, however, is problematic -- and the tiny Chihuahua has the reputation for being quite the yapper. Proper training can quiet even the chattiest dogs of this breed. Become the pack leader in your household. Regardless of their tiny size, Chihuahuas often believe they're in charge and use barking to get what they want. Eat before your dog eats, and do not allow him on the furniture if he thinks he's pack leader, the American Dog Trainers Network advises. Do not allow the Chihuahua to jump on you since it is a dominant behavior. Ignore the barking. Sometimes dogs bark for attention; the more you respond the more he barks. If your Chihuahua barks at you, do not talk, touch or look at him until he stops. If he stops barking, even if only for a few seconds, face your Chihuahua and praise him for being quiet. This teaches your dog that silence gets your attention. Enroll your Chihuahua into a dog obedience class. These classes teach methods to control negative behaviors such as barking while exposing your Chihuahua to dogs and strangers — two popular barking motivators. It's a controlled environment free of embarrassment since many of the other dog owners will be feeling the same. Teach your Chihuahua to bark on command. Say “speak” and have someone immediately create a stimulus such as knocking on the front door. Put a treat in front of the dog's nose and, as he sniffs the treat, say “speak.” Give the treat when he barks. Practice the speak command, then teach your Chihuahua to be quiet on command. Tell your Chihuahua to speak, but when he starts barking say “quiet” and stick a treat under his nose. Praise him for being quiet and give him the treat. Stay calm and do not yell at your dog. Yelling sounds like barking, which encourages your dog to bark with you. Your dog senses your frustration and quickly becomes frustrated himself, leading to more barking. Your dog barks to relieve frustration, according to Cesar Millan. 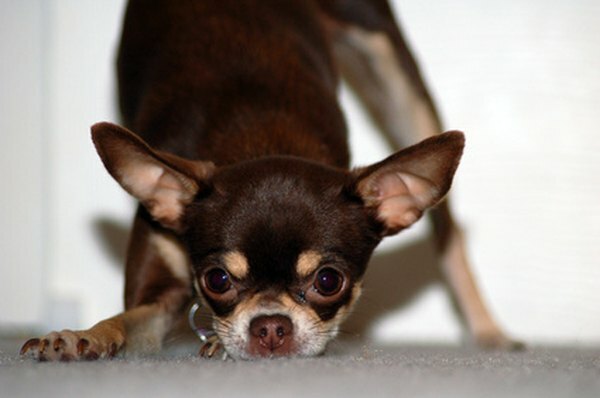 A daily walk can help your Chihuahua release pent-up energy, a common cause of barking. Remove barking motivation by closing curtains, keeping outside potty-breaks short or putting the Chihuahua in a room away from motivators. Another method is this: Put your Chihuahua in a crate or small enclosed room. Walk away a short distance within his view. When he starts barking, ignore him. When he stops barking, turn, praise and give a treat. As he catches on, increase the length of time he must stay quiet to get a treat. Do not place Chihuahuas on their backs attempting to achieve pack leadership. This maneuver can lead to aggression, causing your excessive barker to turn into a biter. Do not baby this tiny breed since Chihuahuas are prone to developing human-induced small dog syndrome, which causes dominant behavior issues such as jealousy, aggression and extreme suspicion toward strangers, according to the Dog Breed Info Center.